Terrell Sanders is president of MainStreetOpen, a web development company that played a major role in creating UBCentral.org and UB.org. Last week he sent out a “Website Audit Checklist.” He recommends taking a good look at your church website a couple times a year, and there’s no better time than at the beginning of the year. Verify that your contact information is still accurate. We’re talking church name, address, phone numbers, email addresses, etc. Verify that the content is current. Go through all of your pages. Is there info that needs to be deleted or updated? Verify that your staff information is current. Check names, phone extensions, emails, family descriptions, etc. Is it time for new staff photos? Verify that all links work. This means links to pages in your own site (including all navigation links), and links to other sites. Verify that all programming works. Test functions like contact forms, database lookups, and other bells and whistles. Make a site backup. Store it on a CD or a different server than the one which hosts your website. Check for security updates. If you use a content management system, the software may need some security updates. Most important: Verify that your site still makes a good first impression. Many potential visitors will check out your website before coming for a visit. The number of “likes,” as of July 15, stands at 573. So we pretty much obliterated the 500 barrier. A 15% increase in one week. I posted several hundred photos from National Conference last week. Posting photos, I’ve found, always draws new people to your Facebook page. I’ve seen that with the Facebook page for my own church, Anchor Community Church. I frequently post photos that I’ve taken at Anchor events. When you “tag” someone in a photo–that is, when you identify a Facebook member in a photo–then that photo appears on their own Facebook wall. That makes it visible to all of their friends. In Anchor’s case, the people who “like” Anchor’s page average 300 Facebook friends of their own. Most of those friends have probably never been to the Anchor page. But when they see a photo of their friend or relative, they click on on it, and suddenly there they are, on Anchor’s page. Some of them, then, tag people in photos who may be on their own Facebook friend list, but who may not be on Anchor’s “like” list…yet. Then those photos appear on other people’s walls, visible to a whole new set of friends–a second degree of separation, if you will. One or two degrees of separation quickly adds up. If Anchor’s page has 300 friends, and each of those persons have 300 friends (and that’s the actual average–I checked a while back), you’re talking 90,000 people…each of whom have 300 friends. Sure, lots and lots of duplication. But still. That no doubt explains the surge in “likes” for the UB page. I’ve tagged United Brethren people in many of the photos. So, for instance, when UB persons see a photo of their pastor at the conference, they click on the photo to see what it’s about, and find themselves on the United Brethren page. And they think, “I didn’t realize there was a United Brethren Facebook page.” They click the “like” button…and there you have it, 75 new people added just because I posted some photos. Ah, the power of Facebook! Facebook has reached critical mass–over 600 million users worldwide. Lots of people in your church probably use Facebook–far more than you realize. Which begs the question: so what? Email long ago reached critical mass. If someone was connected to the internet, they probably had an email address. So it made sense to create church email lists as a way to contact people. Now you should consider adding Facebook to the mix. Your people are already using Facebook–young and old alike. It’s just a matter of going where they already go. My own church, Anchor Community Church, has been using Facebook for nearly four years. We’ve had our own Facebook Page for two years (a growing number of UB churches have their own Page). Anchor has an attendance of about 130, but have 312 people who “like” our page. We don’t actively promote it. We don’t encourage people to create a Facebook account and come “like” our page. It has just blossomed naturally. But for me, the benefits of Facebook have little to do with the church page itself. Rather, it’s about people interacting outside of church. Facebook helps promote community, even if it’s only in superficial ways (and on Facebook, there is an abundance of superficial). People who may seldom talk to each other at church may connect regularly on Facebook. As a layperson at Anchor, I learn a great deal about my fellow Anchorites from Facebook. By reading people’s status messages–things they write which tell something about what’s happening in their life or what they’re thinking about at the moment–I catch numerous glimpses into their life. And that gives me opportunity to interact with them on Facebook and at church. I learn when people are sick or in the hospital, and how they’re doing as the days pass. I learn about financial hardships, relationship problems, new births, jobs lost and jobs found, myriad concerns, car problems…you name it. I can then respond directly on Facebook, giving encouragement or congratulations or whatever is appropriate. I learn about hobbies, extended family, favorite sports teams, books they’re reading, TV shows and movies they’re watching, vacation plans, and much more. I can then use this information to strike up a conversation at church, perhaps with someone I don’t know well. Or I can simply comment right on Facebook. When someone misses church, I send them a note on Facebook saying that I missed them. I compliment people for this and that. Other Anchor people do the same. It’s neat. When we have special events, I take lots of photos. I post them on the Anchor Facebook page. This draws not only people from the church, but their friends and relatives and distant acquaintances. And I’m only touching the surface of what you can do with Facebook. Like plugging upcoming events. It’s not something we officially promote or encourage. It just happens. You don’t see this kind of thing happening with email, Twitter, a church website, or most anything else (young people avoid email, and older people, me included, don’t care to learn all the insider terminology and techniques of Twitter). With Facebook, you don’t need to goad people into signing up for something new. They’re already signed up. Just go join the conversation. Feedburner: 204 subscribers. Feedburner is the best way to keep current with UB news, since the news comes to your email every day. People who subscribe to Feedburner love it. Subscribe here. 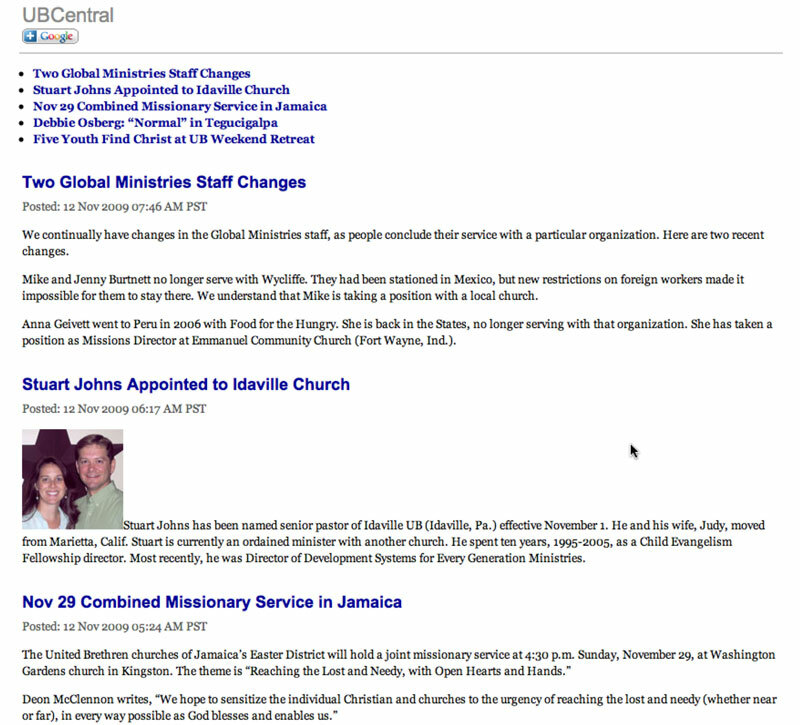 Connect Email: 1100 subscribers, including people from most of the countries where we minister. Connect is an occasional, as-needed email (the last one was sent out March11, 2011). It would be great if you collected subscriptions from others in your church. We don’t use this list for anything else. Subscribe here. WAVES: 277 subscribers. This is a fairly new quarterly email from the Women’s Ministry Leadership Team. It’s designed as a resource for women. Two editions have gone out so far. Subscribe here. Want to receive UBCentral posts by email? Just enter your email address below and hit the “Subscribe” button. Feedburner is a free service from Google. You’ll receive an email asking you to confirm the subscription. All you need to do is click on a link. Every day, not long after 11 a.m., you’ll receive an email containing the news items posted during the previous 24 hours on UBCentral.org. The emails look like this. Frankly, I don’t expect a lot of people to use the Twitter feed, mainly because not all that many UBs are using Twitter, period. We’re far from critical mass. I’ve come across less than 30 UBs with Twitter accounts, and many of them aren’t actively using Twitter. It’s not exactly a necessary communications accessory. But, this was easy to implement and will involve little work on my part. And Twitter is mushrooming in popularity. So, there it is. Use it if you want. Tony Morgan, the “Chief Strategic Officer” at a booming megachurch in South Carolina, is one of the premier bloggers in the evangelical world. He’s especially popular among the cutting-edge crowd. Really an interesting guy. He just posted “25 Free Web Apps That Make Life Easier.” Increasingly, things are moving to the web. Instead of using a program you install on your computer, you go to a website and accomplish the same thing, whether it’s managing a calendar, writing Word documents, or managing your finances. I was aware of, and use some of, the web apps that Tony mentions. But others were new to me. Depending on your level of geekiness, you may be interested in checking out his list. What web apps would you add to the list? Mention them in the comments.